Question: My start menu is very messy and I cannot instantly find the program that I need. (Windows XP, 2000, 98, ME) I would also like to instantly find the document, piece of music, photo, video or even a website that I want. In addition, I really want control of my Start Menu. Solution: If you are having this problem, there is a program called ‘Engage’. Engage will categorize your programs. (If there is a program that is not categorized, you can help the Engage team to categorize that particular program) In addition, you can instantly find websites just by typing the keywords of the URL. For example, if you want to go to http://www.google.com, you can just type Google and hit enter. 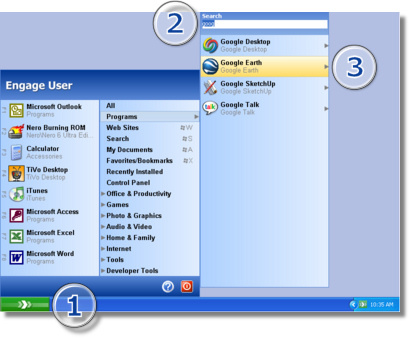 Moreover, it gives you some of the neat features in Windows Vista. There is a instant search function which you can type the first few letters of a program, file, videos or photo and you can instantly access that file. Plus plenty of other great features. Entry filed under: Software, Tune up, Windows.